Post #16 – What is stress really and why is it bad for longevity and health? Stress has become such a common buzz word. We all talk about it. We generally know it is bad for us. It is constantly in the news. There are exceptions though. Some believe that stress is good, arguing that if you take away the stress you take away the motivation and drive. But whenever I get into conversation with someone and start to dig a little deeper with questions like, “So, what do you think is stress?” “Why do you think that stress is bad?” Why do you think it is good?” Or, “How do you deal with stress?” The subject becomes very squishy, very quickly. So, let us take the first question first, what is stress, any ways. Acute Stress: Fight or flight. The body prepares to defend itself. It takes about 90 minutes for the metabolism to return to normal when the response is over. Chronic Stress: The cost of daily living: bills, kids, jobs…This is the stress we tend to ignore or push down. Left uncontrolled this stress affects our health- our body and our immune system. This is the type of stress that causes wear and tear on our bodies and can impact health and longevity. Distress: “Bad stress” in daily life that has negative connotations, e.g., divorce, punishment, injury, negative feelings, financial problems, work difficulties. So, from the point of view of theses definitions, the stress is really a subjective concept, based on how we perceive a thing or an event. The same event or activity, say a roller coaster ride, could be a eustress (good stress) for one person and distress for another. This is why psychologists or mental health practitioners often get involved in diagnosing and helping cope with chronic stress. Although stress is a subjective concept, the impact on our bodies is often very objective and real. We have all experienced the rising of hairs on the back of the neck, the sweats, tension in our gut, racing of heart, dilating of pupils, and pumping of blood in our face, arms and legs. 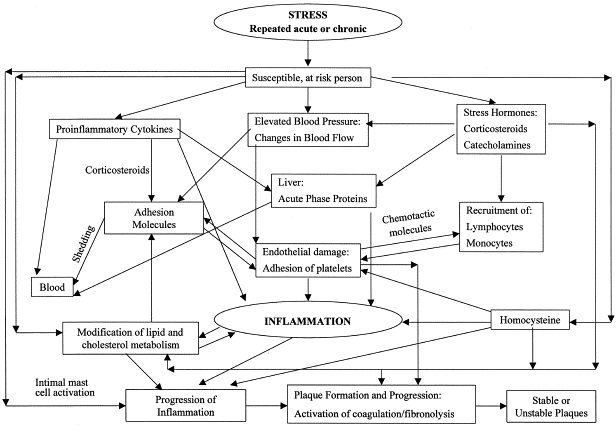 Physiological effects of most acute stress events subside about 90 minutes after the conclusion of the stress event. Body returns to normal homeostasis or biological equilibrium. Most of us recognize some of these biomarkers. Others are quite esoteric. In any case, from this list, it does not take a neuroscientist to figure out that chronic stress can mess with a number of things that are key to our health: insulin, cholesterol, hormones, our immune system, can cause inflammation, reduce energy level in the body and impact working of our brain. Looks like a real important subject to me, if we want to live healthy life free of chronic diseases for an optimal life span. What do you think? How do you fee about stress? Post #14 – Want to know how to quickly revitalize yourself? We have all heard – sitting all day is one of the worst things we can do. Yet, that is exactly what most of us do, and do a lot of it, whether at the office or at home, or traveling. Sitting for long periods, we lose vitality, our muscles weaken, our joints lose flexibility and range of motion, lymph fluid stays stagnant, posture gets deformed, blood circulation is diminished, our eyes, neck and shoulders feel strained, and host of other issues can start creeping up. So, I started thinking of developing a quick routine that could revitalize my body, can be done in the office, home or anywhere, e.g., in an airplane or at a rest stop on the highway. Based on what I have learned from the various coaches and masters over the years and have been practicing in parts and pieces, I put together a simple, yet complete routine. I started asking everyone at our office at A&T Systems to do it in the afternoon everyday. We have had a very positive feedback on this program. This is how we do it at our office. Three minutes before the stretch time, on our paging system, receptionist invites everyone to join the stretch. Those who are able to, get together in a conference room at 3:15pm and then someone from the group leads the stretch. Initially, for a few weeks, I led the stretch. Then, I wrote the routine down and now with the detailed instructions provided, anyone can lead it. I would suggest that you try it for few days and if you have a positive experience, figure out how to add it your lifestyle to increase vigor and vitality. Did you experience a shift in your energy level? Did you find yourself better physically and emotionally? Do you have a favorite routine to vitalize and invigorate yourself? So, here are the instructions. HINT: It is helpful to print the following instruction in an enlarged font, so it is easier to read as you are doing or leading the routine. Set up music (140-150 beats per minute) – For example, Pandora Radio Station KernKraft 400.
d. Repeat c with Left leg.